All guns are banned already for everyone under threat of prison unless you have a licence authorized by the federal police. TheGunBlog.ca — A new group of Canadian doctors backed by the country’s main medical organizations is urging the government to ban and seize guns from federally licensed hunters, farmers and sport shooters. Its leader compared new restrictions to a “preventative vaccine” against a disease. Ahmed is a trauma surgeon at Saint Michael’s Hospital in Toronto who worked to save gunshot victims after July’s attack on Danforth Avenue. She blocked TheGunBlog.ca (@TheGunBlog) on Twitter on Jan. 8 after we retweeted another of her tweets with a comment. The group she is spearheading seeks new prohibitions and “an amnesty program to recover firearms currently in circulation,” according to its position statement. The doctors support Bill C-71, the government’s planned law against men and women with police-authorized firearm licences. Hunting is at the heart of Canadian culture, and target shooting is one of the country’s most-popular sports. More men and women have a firearm licence than play hockey, football, tennis or who ski. In addition to the country’s 2.2 million permit holders, millions more family and friends of all ages hunt and shoot safely and responsibly under their supervision. The Danforth attacker — who ignored the handgun ban that applied to him — didn’t send more shredded bodies to Ahmed because he was stopped by police who shot back. The murderer then killed himself. All guns are banned already for everyone under threat of prison unless they have police or military permission. Ahmed began her campaign against Canada’s most-lawful demographic in mid-November as the Coalition for Gun Control kicked off a new disarmament effort of its own. Nov. 20: Shared Coalition for Gun Control disarmament campaign. Jan. 28: Facebook page, initially using the same photo Ahmed has on Twitter. 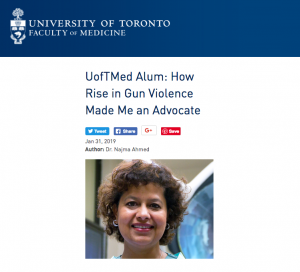 Jan. 31: Article on website of University of Toronto Faculty of Medicine, where Ahmed works as a professor and vice-chair in the Department of Surgery. About zero people die each year at Canada’s 1,400 shooting ranges. That compares with close to 100,000 annual deaths and serious injuries from doctor error, the National Post reported in January 2015, before the current opioid epidemic. Updates: Feb. 3: Adds tweet by Dr. Ozzy Ramirez. Feb. 4: Removes personal tweet that was attributed to a federal employee. This article was originally published at TheGunBlog.ca.